2017 Update: Had to do it. Just had to. 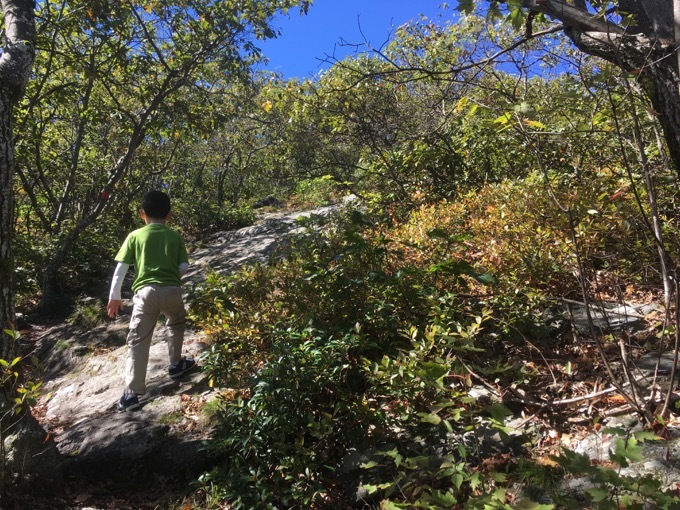 With my son Calvin ready, willing, and able to climb mountains, it was time for him to stand upon the highest point in our home state: the infamous south slope of Mt. Frissell on the Massachusetts border way out in Salisbury. This first trip report annoys me not only because the pictures are tiny, but also because the writing style predates CTMQ. And I never like pre-CTMQ prose. Oh well. At least I can now slot in some better pictures from 2017. Fo’ sho’, my nizzles. Mt. Frissell is a bizzle. If you understand what I’m saying, then good. If not, please continue anyway. For the record, “Frissell” is indeed pronounced like “drizzle,” which makes my Snoop Doggisms ok in the world of hip-hop slang. After 17 months or so of being official highpointers, Hoang and I finally summitted our home state. 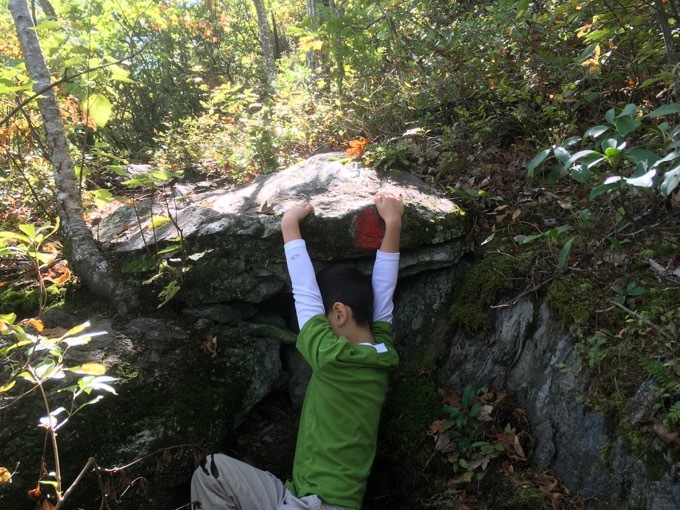 There were many firsts, lasts, and oddities surrounding this climb. This was the last time we’d be taking my crappy old car with no air conditioning on any road trips. 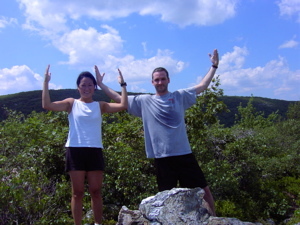 This was the first highpoint that required climbing two mountains only to descend to a highpoint. 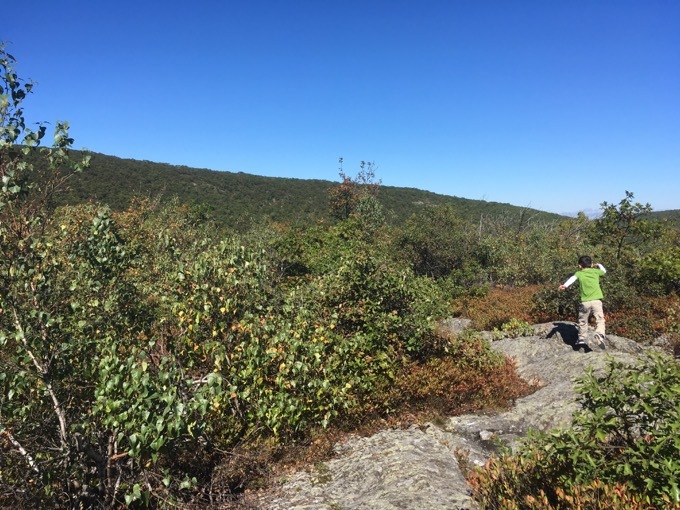 This was the first (relatively) unmarked, unremarkable highpoint we’ve done. This was one of only two US highpoints not on a true summit (NV being the other). 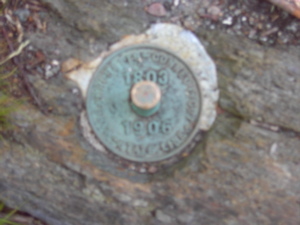 This is the only highpoint that its state refuses to recognize; maintaining a highpoint marker on another, incorrect mountain. And finally, this is our first one that we’ve (sort of) tried once already. The falls are quite nice and I was a bit surprised by the number of people who had made the trek here. 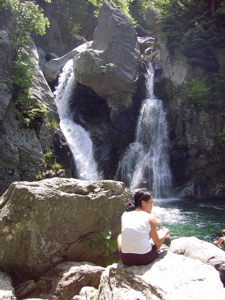 The park is in the extreme SW corner of Massachusetts, and the road to get there coupled with the steep hike to the base of the falls must deter many daytrippers. The water was surprisingly clear and refreshingly cold – but the park rangers who stood sentry kept anyone from jumping in. If they didn’t do the trick, the ghastly park information sign surely should. Aside from a few maps of the park, there are about twenty articles from recent years chronicling the numerous injuries and deaths at the falls. Not exactly a ringing endorsement for the park! 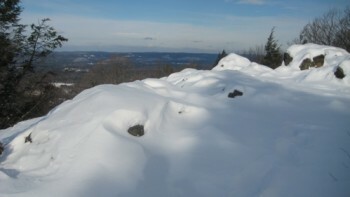 After poking around the falls a bit, it was time to get to our real destination of the day, the highpoint of Connecticut. Surprisingly, my piece of junk car performed admirably up the steep inclines and over the bumpy gravel roads. Fortunately, despite the mid-90 degree temps at home, the puffy white clouds and trees kept the temperature tolerable on the drive. We found the small parking area and proceeded to leave the car in front of a closed gate. Not smart. There is a tiny hand written sign on the gate imploring dopes like us not to park there… More on this mistake later. Just as we passed these folks, the trail went straight up Mount Round. 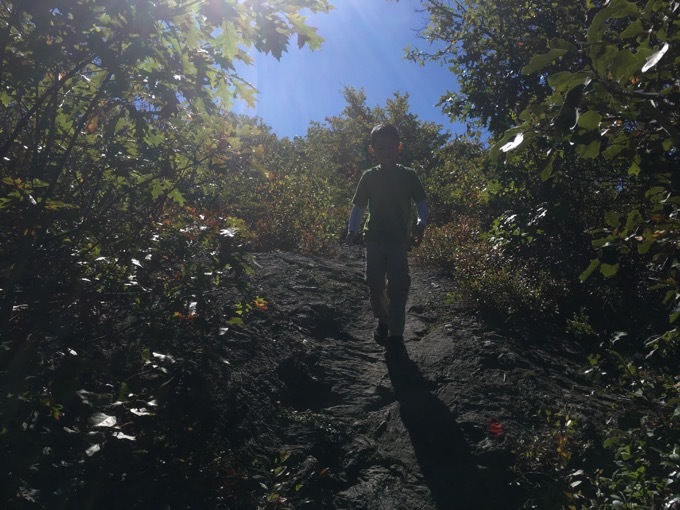 I have to admit, we were a bit surprised at the steepness of the trail here… We had no problems at all, but still, I didn’t think we’d have to use our hands to climb up so much. (Especially after seeing those old ladies coming down!) 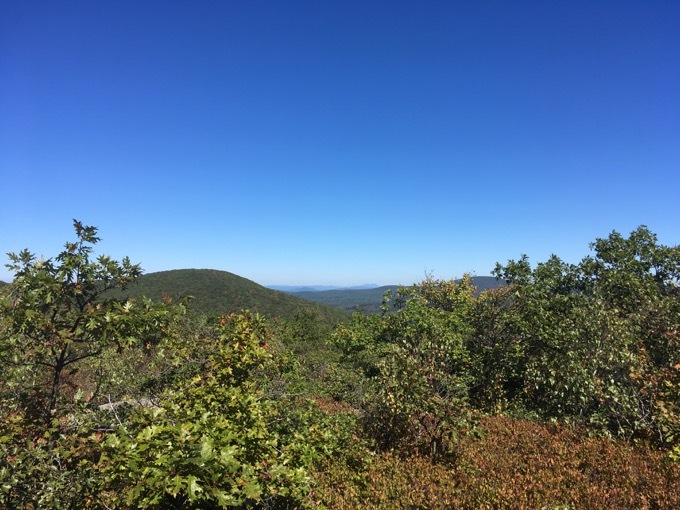 We were rewarded at the summit with 360 degree views of the southern Berkshires, Bear Mountain (the “fake” CT highpoint), Riga and South Lakes, and just to the west of us – Mt. Frissell. 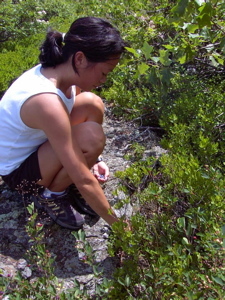 We were in no hurry however, as the exposed summit was covered in blueberry bushes – full of ripened berries. The breezy respite allowed us to cool off as well. I was very impressed with the views and the solitude of the place. 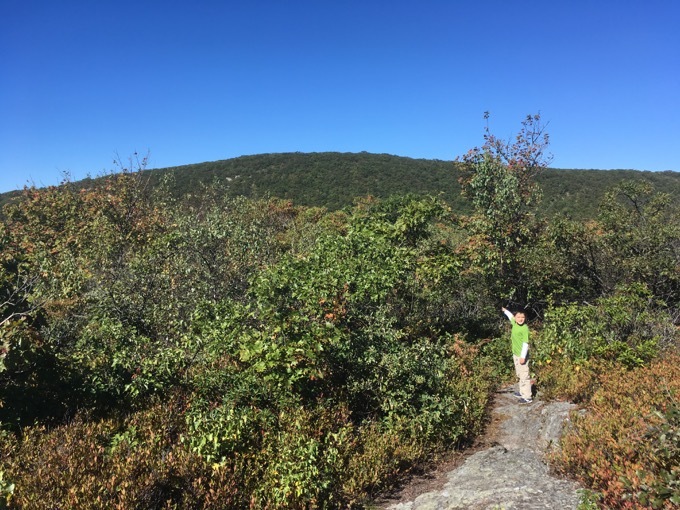 This is not a popular trail, as New England highpoint trails go, probably because of the fact that CT doesn’t even acknowledge it. I’d assume only tri-pointers and highpointers make the effort to get here. At any rate, it’s worth it on nice days like we had. 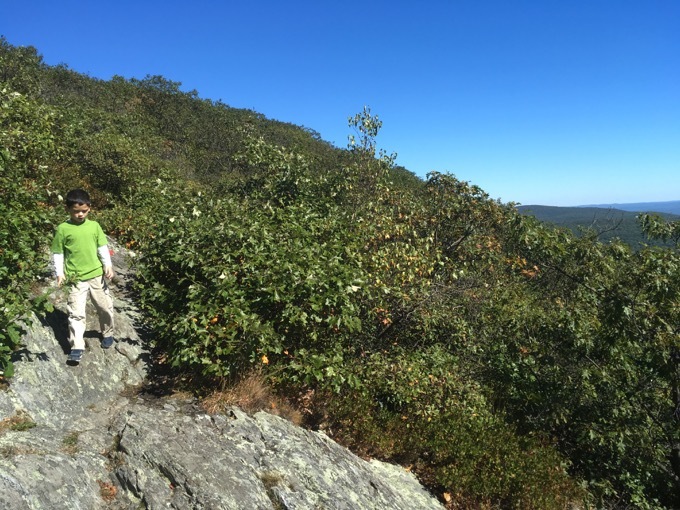 After picking and eating the berries, we were off to Mt. Frissell via a small col between the two mountains. The climb up Frissell was as steep as Mt. Round, but also equally short. Despite being a hundred feet or so taller than Round, the summit views on Frissell were pretty weak. We didn’t dawdle so close to our goal. 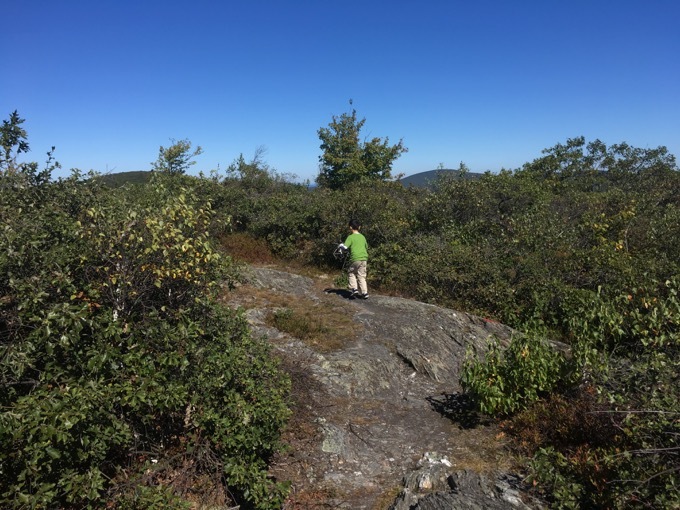 A few minutes’ hiking south and west around the peak (in MA) and we came to the 3 inch brass/green stake in the ground marking CT’s true highpoint. In fact, Hoang walked right past it at first. Despite the somewhat odd location, there was still a pretty good view of the aforementioned lakes and we enjoyed a snack and a drink in a very refreshing breeze. We chilled for about 15 minutes and retraced our steps back up Frissell, down and up to Mount Round, and picked and ate lots more blueberries. So far, this was the best smelling hike we’ve done, as the laurel and berries mixed to fill our noses with an intoxicating sweetness. Honestly, it was really pleasant. Much better than I thought this trip would be. Some Ukranians (or something) were up there filling up gallon containers so we asked them to take our picture. 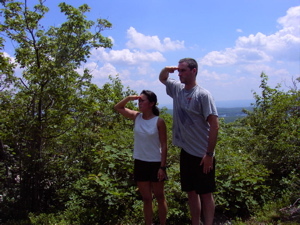 I think they were a bit confused by our “lookout” pose, but we had to maintain the tradition! We decided we had had enough of the berries and the views and picked our way back down to the car. As we got closer, we could hear the unmistakable “beep-beep-beep” of a truck backing up and I became quite concerned. There’s no reason a truck would be along that road in the middle of nowhere backing up unless… Unless it was towing someone. I remembered my parking spot and also reading somewhere that one shouldn’t park in front of the gate. This was unfortunate because in my haste to get back to the lot, we passed a highpointing family (they were carrying the Holmes book) and instead of stopping to chat as we’d liked to have done, we jogged right past them. I didn’t voice my concerns to Hoang, but as we approached, I did hear someone opening the gate we were blocking. I breathed a sigh of relief upon seeing my car where we’d left it, and didn’t exactly call attention to the guy walking away from the gate down the path. I’m sure he wasn’t too happy with me… And I’m also quite sure that truck we heard was indeed towing someone else who was in the way as well. I’m convinced we got lucky. After our nice hike in perfect weather (OK, it was a bit warm. See sweaty pictures above and below) we had a nice drive home through NW Connecticut. Several others have pointed out that Mt. 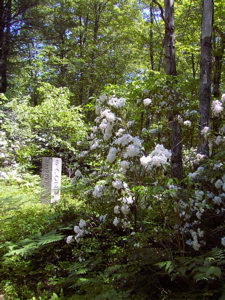 Frissell’s surrounding towns are the “toniest” in the country near a highpoint. I suppose this is true, with Great Barrington, MA and Salisbury, CT nearby, but since we currently live here (in slightly less “tony” West Hartford), we didn’t really notice. Or maybe Connecticut doesn’t seem so rich to us since I’m a resident and my crappy car is held together by duct tape. I’m not going to write anything about this hike that I did with my friends Tom and Scott other than to say it was a) awesome, b) humid, and c) for charity. 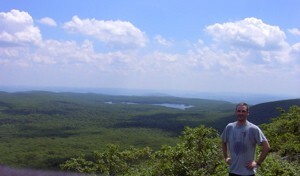 We hit the highpoint on our way to the CT/MA/NY tri-point. You can read about it here. It was part of an all-day crazy Extreme CT Geography Challenge/Tour. Which, now that I write this five years later… seems nearly impossible to pull off as well as we did. I said pretty much all there is to say about this hike above. I was just happy to get out there again with Calvin on an absolutely perfect day. The trail is the same, the effort is the same, the gate out on Mt. Washington Road is the same. Don’t park in front of them. Drive carefully. The road from the Connecticut side is still a bit dicey. 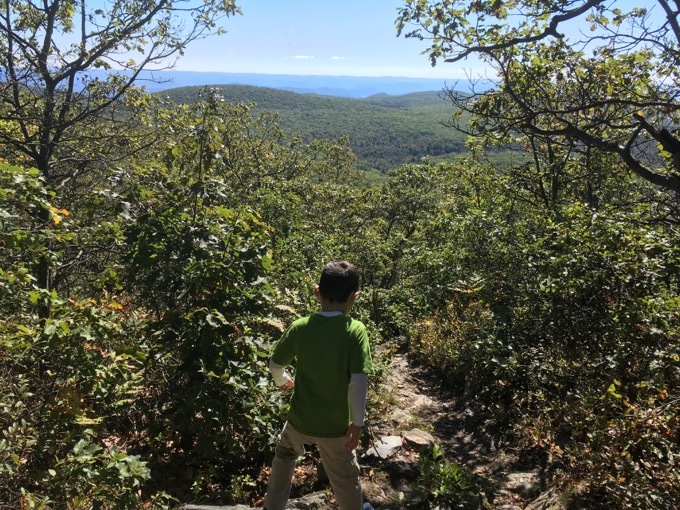 Calvin scooted up Round Mountain like the billy goat he is to first reach the second highest summit in Connecticut. Round Mountain hike report here. From there, it was down into the col and then up the eastern face of Frissell. 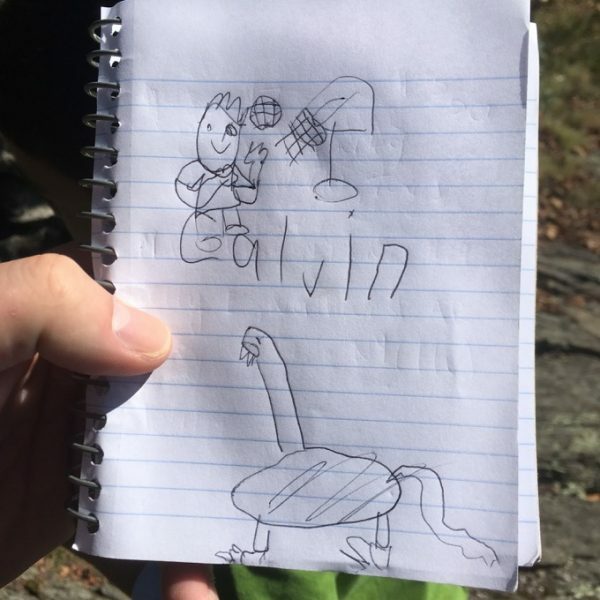 Calvin began to tire a bit during this ascent, but that’s to be expected from a little kid. I tried to explain the vagaries of highpointing as it relates to Connecticut’s unique one, but I’m not sure it resonated very well. 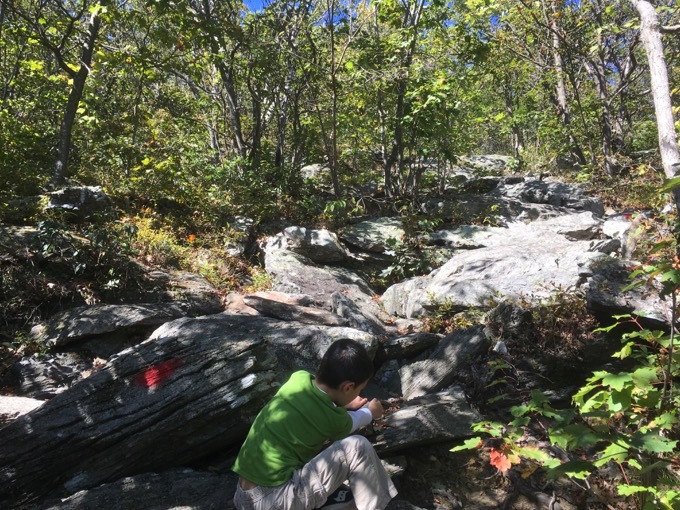 He was too concerned with the bright red blazes on the rocks and spent the time concocting stories about the dinosaurs’ extinction event and how maybe the red paint is actually their blood. Y’know, y’all have your hiking partners. You talk about current events and the current state of world politics and maybe some sports stuff. 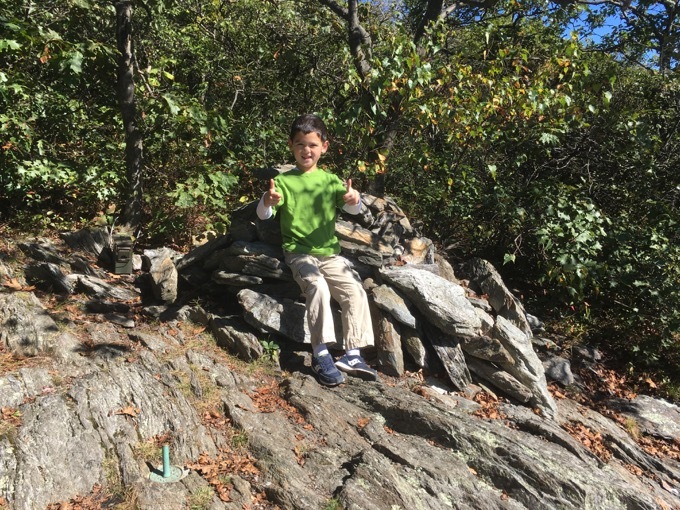 MY hiking partner revels in the idea that 65 million years ago dinosaurs fell down Mount Frissell, smashed their heads on rocks, and became extinct. 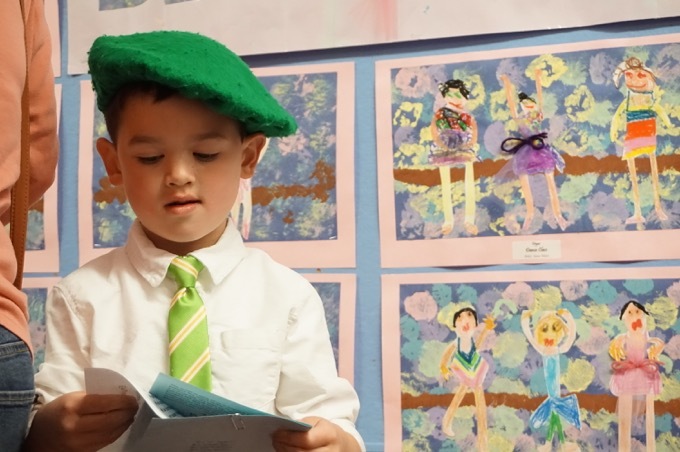 As we approached the ridiculous green stake marking Connecticut’s highpoint, Calvin had moved on to ask about a motivational poster that hangs in his school’s gym and whether or not humans really do climb up cliffs and hang off of them. He thought about it and decided that was not something he’d ever want to do. 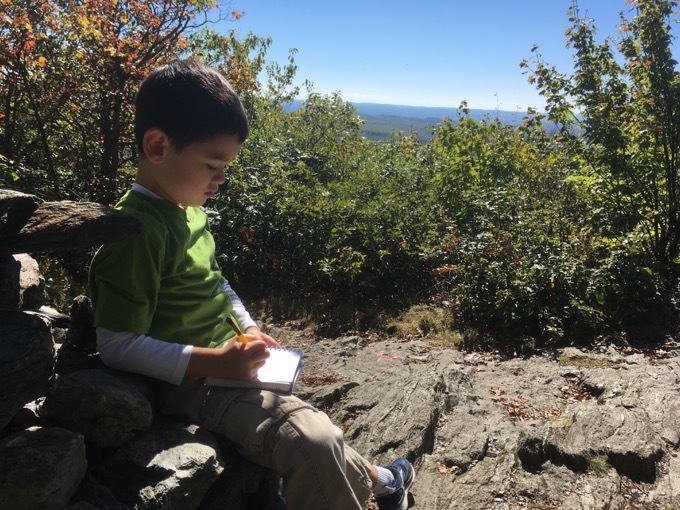 I chuckled as we approached a couple signing the register… just to overhear a six-year-old pontificating in the middle of nowhere on a mountain must be pretty funny. Calvin decided to draw a dinosaur in the register, and for some reason added himself playing basketball as well. Then it was back up Frissell, back down Frissell, back up Round, and back down Round to the car. It was a great day out and I can’t wait to figure out what’s next for us! Please let me know the date you did your hike. I want to try to time a Bear mtn. 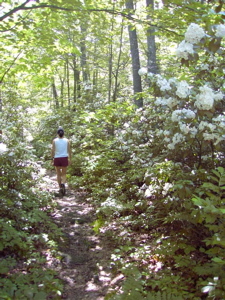 hike for the laurel in bloom. Shoot. 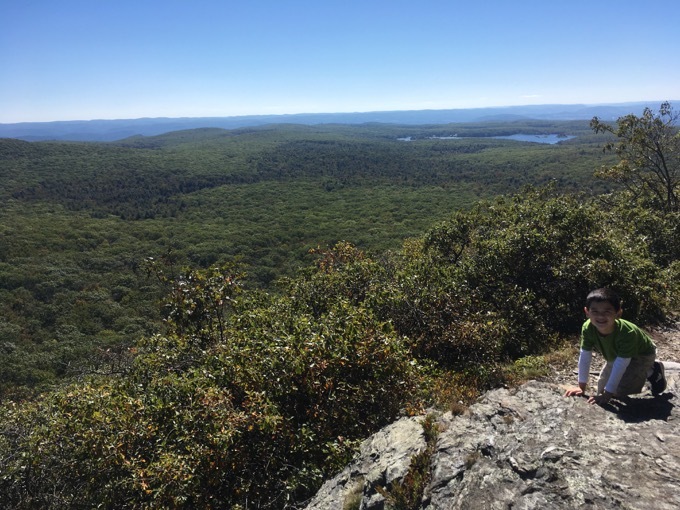 I hiked to the Lion’s Head/Bear Mountain peaks, and thought I had conquered Connecticut. Guess it’s time to make the 2 hour drive back up there and try again! Don – July 6. A good rule of thumb is a week before and after Independence Day.